Jeweled Holiday Nails and Giveaway! I know that I’ve already written about nails once this week, so please forgive me! We have a chance to giveaway Essie’s Holiday 2013 collection to three of our readers and we knew you’d want to get your hands on these in time for your Christmas events. Laurel and I joke about my adult A.D.D. I see something shiny and I’m like… squirrel! Yes, I love a bit of sparkle, especially at Christmas, and Essie’s Holiday 2013 Collection “Encrusted Treasures” is perfect for glamming up your nails! This collection of six sparkling and textured shades was inspired by all things luxurious….jewels, beaded couture gowns and caviar! They can be worn with your most formal dress or they can add that bit of holiday sparkle to a casual outfit. Belugaria has amazing texture…almost like lace!! Peak of Chic is white with rainbow slivers! On a Silver Platter is a soft gold with bold violet glitter. Lots of Lux is a shimmery blue with a matte finish. Ignite the Night resembles hematite with a matte finish. Hors d’Oeuvres is platinum with silver glitter. Thank-you SO much to Essie for sending us their 2013 “Encrusted Treasures” Collection. We have been enjoying our festive, sparkly nails! 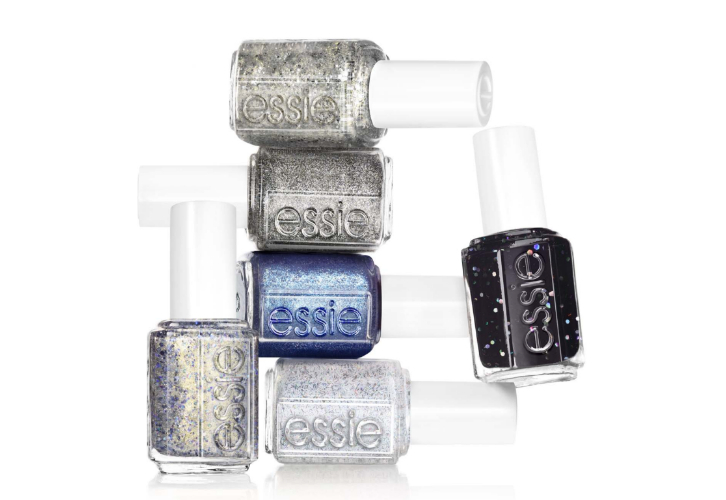 And we are giving away full sets of Essie’s 2013 Holiday Collection to THREE lucky sisters. To enter, please post a comment here about what event you need to glam your nails up for this holiday season. (Comments on our Facebook page will not be entered..sorry!) Winner will be announced on Friday, November 22, 2013. Entries will be accepted until Thursday, November 21, 2013 at 11:59pm.